The example is made in light worsted weight cotton. Worsted weight yarn. See chart above for amount. Dec5 – Decrease 5 stitches – yo, insert hook in next stitch, yo and pull up a loop, yo and draw through 2 loops on hook, yo, skip next 3 stitches, insert hook in next stitch, yo and pull up a loop, yo and draw through 2 loops on hook, yo and draw through all 3 loops on hook. There is a video tutorial available as well. The beginning chain should be a multiple of 23 plus 1. Row 1: 2dc in 4th chain from hook, dc in next 7 ch, dec5 (uses 5 ch), ** dc in next 9 ch, ch3, dc in next 9 ch, dec5. Repeat from ** across to last 8 chains. Dc in next 7 ch, (2dc, tr) in last ch. Turn. Make all subsequent rows by crocheting into the front loop only. Row 2: Ch3 (counts as a dc), 2dc in tr, FPtr in next two dc, dc in next two dc, FPtr in next two dc, dc in next dc, dec5, ** dc in next dc, FPtr in next two dc, dc in next two dc, FPtr in next two dc, (2dc, ch2, 2dc) in ch sp, FPtr in next two dc, dc in next two dc, FPtr in next two dc, dc in next dc, dec5 Repeat from ** across to last 7 dc and turning chain, dc in next dc, FPtr in next two dc, dc in next two dc, FPtr in next two dc, (2dc, tr) in top turning chain. Turn. The blanket can be made in a solid color or can be made with any number of color changes. The best way to make a color change is to finish all but the very last pull through of the two loops of the last triple crochet of a row. Cut yarn with a few inches of tail and join with new color next to stitch. Pull new color through last two loops. Weave in ends. 3/25/14 – added note about crocheting into front loops. Is this the ripple pattern that on the reverse side is a different pattern? The pattern is the same on both sides. Sharon, you could use one/two colors on one side and then one/two different colors on reverse side. I am making this blanket how do you mean (2dc,tr) in last ch. Do i have to do 2Dc and 1 treble crochet then turn? Right. The 2dc and tr are made in the last ch and will also be made in the last stitch of every row. You can turn at that point or make the first three chains of the next row and turn. I love a ripple, too, and have been looking for a new pattern that isn’t identical to the many that I already have. Thanks for this. It’s just what I was looking for. I just love this afghan… I was extremely and happily surprised at ribbed pattern, which doesn’t show up well in the photograph. I made it in a bulky homespun yarn and couldn’t be more pleased with the results. This by far will go down as one of my favorite ripple afghans. if you use bulky homespun yarn for 43.75″, how much yarn to you need, also what size crochet hook? Also, if you use 2 colors how much yarn for each color? I would say around 1,400 yards and use a K (6.5 mm) hook. Use the number of chains for at least one size smaller. For the two colors, it just depends on how you are doing the striping. If are going to do equal sized stripes then you will need almost equal amounts of yarn (maybe a bit more of one that you will use at both ends). Looks like a perfect pattern for my off to college daughter. Her school colors are gold and white. If I wanted to make the medium in two colors with more gold than white, similar to the grey and white one you picture above, how many rows of gold and white? Looks like 1st row and two Row 2 of gold and then one Row 2 of white, then two of gold, etc. Correct? Assuming so, how much gold should I get vs white? 2/3s of 2258 yds and 1/3 2258? Whatever that is!! I did mine with 6 rows of the darker color on either end, then two rows of the lighter color separated by four rows of the darker color. It will be roughly a 2/3, 1/3 split like you said, with a bit more of the darker color. Would make ripple; have made Jacob’s Ladder before and didn’t care too much for it. Definitely prefer the ripple – softer design and more scope for playing with colours. Great pattern! I am working on it today. On your Ribbed Ripple Reversible Afghan pattern for the FPtr stitch you are talking about going around the post of the stitch of the row you are working on and not further down below that…….. Right. Basically instead of stitching into the top of the stitch like you would normally do, you go around the post of that stitch. How much yarn is necessary to crochet the largest size of this afghan listed in the pattern given? For a 43.75″ by 57″ afghan, you would need around 2,770 yards. Thank you very much. I am making it for my rather tall grandson going away to college. what do you mean when you say dec5(uses 5 ch)? Making this stitch uses the next 5 stitches. I found a video tutorial but thought it might be confusing because the FPtr was being made into a row below the last row worked, so differently than how I am using it in this pattern. Let me know if you need more clarification. Honestly, the link you put in with the tutorial video that you made was awesome. Way better than this link above. After watching you do it while explaining, I’ve had all my questions answered. Thanks so much for putting that in there, I’m excited about this project! Oh Mama! =) Thank you for posting this pattern! I can hardly wait to make it! Have a great day! I love this thank you very much for posting this pattern.My Mom showed me years ago how to do this so I am going to make one in pink for her,I lost her last mouth to cansure and I miss her very much.This is going to be for all who are fightting and the ones who lost there lives becasthe Lord said it was time to come home to him. I did my first Ripple the night in 1969 when we first landed n the moon. have you ever come across a pattern that’s reversible but the each side has different colors? i know it’s an old pattern . I don’t know if any of these are what you were looking for, but here are a few I found. PLEASE someone help me!! I dearly love this pattern and started trying to make it three times even going back online to see if I had cop0ied the pattern right. I The pattern is fine and I am loving it until I get to the first FPtr. I have watched the video and tried as hard as I can and I just cannot get the hang og that stitch. Instead of giving up, I’d like to know if anytone can suggest a stitch to use instead of it that won’t disrupt the overall look of the pattern? Can I just do a Tr stitch without the front, back, sideways tr stitch?? Btw, my skill level is between easy and intermediate. HELP!!!! Thanks! Can you tell me how many sc to begin a chain that is 70″ W with a ripple pattern of 7 sc up and 5 sc down sk 2 sc? Usually single crochet ripples are done with the skip 2 for the valleys and 3 sc in one sc for the peaks with an equal number of sc on either side of that peak. Also, sc ripple edges are usually by skipping the last sc and not working it before turning and skipping one stitch after the turn. The beginning chain will need to be a multiple of 13 chains, plus 12. The best way to get the closest to your desired 70″ width is to work a few rows on a sample. If you start with a chain of 25, this will give you the width of 2 repeats. Divide that width by 2 to find the width of one repeat, then divide 70 by that width to find how many repeats you will need to have to get your 70″ inch width. Then multiply that number of repeats by 13 and subtract 1 and that will be your starting chain. Row one: Skip one chain, sc in each of next 5 chains, 3 sc in next chain, sc in each of next 5 chains, ** skip 2 chains, sc in each of next 5 chains, 3 sc in next chain, sc in each of next 5 chains. Repeat from ** across to end of row. All other rows: Skip one sc, sc in each of next 5 sc, 3 sc in next sc, sc in each of next 5 sc, ** skip 2 sc, sc in each of next 5 sc, 3 sc in next sc, sc in each of next 5 sc. Repeat from ** across to end of row, leaving one sc. I’m so pleased with your site and am amazed and happy with your explanations of all the different (and sometimes the same)questions. I think this sc small ripple should be good for a baby blanket. What a great blog! Thanks for all the follow up comments. I am going to give this one a try. I love a good, easy ripple. say, Mamma, how do you like a cotton afghan? Does it get to heavy if it is sized for a couch? What about fading? Thanks! I still prefer acrylics for large afghans for the weight factor. I’ve been making lapghans for charity and using all fibers for them. Cotton fading depends on quality but they all will eventually. There are some amazing cottons these days. Because of allergies, I only use cotton yarn for every thing I knit and crochet. Have made several cotton afghans. Baby afghans look great, not very heavy but they breath so in summer babies can still have a cover but not get too hot. Have also made shrugs and shawls all have turned out great. I make dishcloths and I have washed them in hot water with bleach and yes the color fades then. If I wash them in the cooler water and use Oxiclean then they don’t fade as fast. They really hold up to the daily use in the dishwater. I am trying to make this afghan. And I have made it to the second row. I do not understand doing the dec5 in the chain 3 from the first row. That is where it is ending up? Also if you keep dec5 it will not be a ripple? The end of row 1 is dec5, dc in next 7 ch, (2dc, tr) in last ch. So coming from the end of row 1 for row 2 – ch3 (counts as a dc), 2dc in tr, FPtr in next two dc (which were the 2dc in the last ch), dc in next two dc, FPtr in next two dc, dc in next dc (these five stitches use 5 of 7 dc before the dec5), dec5 which uses the last two of the 7dc, the dec5, and 2 from the next stretch of dc. How many rows do you recommend for a baby blanket for the smallest size. I know I can just continue till I’m happy with it but would really like your opinion…thanks so much. It took me a little while to get row 2 figured out but once I did it is an easy pattern to do. If it is working out to be about 35″ wide, I think a good length is 42″. That is a good general purpose baby blanket size. That would be around 60 rows. So could you help me…how many do I need to chain first for the first row. I want to make a plain reversible, ripple for my first baby due May 2013, but I am having trouble finding a pattern to tell me how many to start my chain. I had started this blanket but it was crooked and I undid it completely and now I’m kicking myself because my books are in storage and craft store didn’t have one. I’ve been searching online for weeks. I can help you with that. What size blanket do you want to make? What is the gauge of your yarn and what size hook are you using? Do you want short and shallow ripples or longer and deeper ripples? LOVE this pattern! Gorgeous, and a great stash-buster! Love this pattern!!!!!!!!! I crochet while my husband watches football. Thanks for a great pattern. I love the color. What kind, what color & where can I buy it? This is made in Knitting Fever King Tut which is a cotton yarn. This was donated by a local yarn shop, but I have seen it being available at online stores. The darker seafoam is 441 and the lighter is 1042. Love the pattern but I am having problem on the second row when it gets to the last seven stitches. D)FPtr in the next two dc . When get to this point I am already out of the stitch. Please sweet ladies tell me what I am doing wrong. Mama is there a diagram for the stitch? If you are used to diagrams that would probably be the best way to get a visual of how this works. Let me know if this doesn’t help. I have become sooo hooked on your patterns- literally and figuratively. Will be working on them for the next year or two. Thank you for having such a creative mind. I am just a beginner and this will be my 3rd afghan, but I really want to make this one for myself. Have you or anyone put this on youtube so people like me who have a terrible time following patterns would be able to do this? Thank you so much for the video, it is the way I seem to learn the best. I really appreciate your doing this for folks like me. I just wanted to say that I am an “advanced beginner”… that is… I know the basic stitches and have done multiple afghans using sc, dc, and hdc… but I had never gone beyond that, or mixed those up at all. THIS pattern is the perfect transition pattern from beginner to the next level! It is a really fun pattern and the finished piece makes it look way more sophisticated and complicated than it actually is in practice. Your video got me through the first couple rows, and I’ve been off like a shot after that! It really does just take doing a few rows and watching your video a few times for it to “click”… after that, I can do this from memory because the rows below basically tell you what the pattern is. This is actually FUN! I can hardly put it down! I’ve bookmarked your site and can’t wait to finish this and go to the next level of complexity. Thank you, thank you, thank you for all your patience and explanations and the video to support the pattern here on this site. Cheers! I am having trouble with the 1st and 2nd rows matching the dec5 stitch. the ch was counted right and the 1st row came out right…don’t understand what I am doing wrong, please help! I have discovered what I was doing wrong. Thank you for the beautiful patterns!!!! I actually didn’t add an edging to mine. The nice thing about this pattern is since it is a one row repeat, you can make stripes of color as thin or thick as you like. It just depends on how you want the blanket to look. I was working with some leftover yarn, so just made stripes that used up the quantities I had. Making the afghan in two colors, when I added the second color on the back side I have stitches from the FPtr am I doing something wrong or do they show? They do show. My colors were similar so they weren’t as noticeable. I haven’t started the pattern yet, but I already love it. Is there a way I can do this pattern with a size I crochet hook and worsted weight (4) yarn instea without chaining so many stitches? That would only very slightly increase the size. It’s hard to avoid having to start with a lot of chains for a ripple because the ripple shrinks the width. 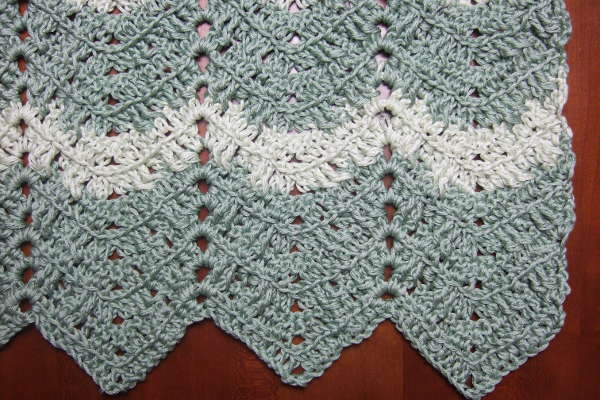 For a highly rippled afghan like this one, the ripple usually results in a width about half that of the beginning chain. The two ends should be mirrored images of each other. What does yours look like? Thanks for this beautiful, simple pattern. It looks so intricate but it’s a simple one row repeat for almost the whole afghan. I’m making one now for a wedding gift but will be making one for myself soon. I love making snuggle-ghans. Although your pattern did’nt say, in your video did you say to crochet in the front loops? I did. It can be done in the front loops or both loops, but for the look of the sample, front loops. This is beautiful. I’m currently working on the Jacob’s Ladder Ripple pattern you have. It’s so easy! Thank you for writing your patterns so simple and easy to understand! I am making this for my 5 yr old grandson. He sleeps in a twin bed. What size would you recommend? This is actually my very first ripple but it looks beautiful! Do you have any more pictures of it? Is there a way to do this pattern in the round ? It would have to be done quite a bit differently since part of what makes this reversible is that the same row is repeated on both sides. I haven’t written one, but if I do, I will let you know. I love the ripple afghan very much. I like afghans with different stitches then the norm. i also like this one because its the same on both sides. thank you for shareing. thanks for the pattern. Looking forward to making it. I Wanted to make this ribbed ripple reversible afghan but don’t understand the last direction on row 1. The very end (2dc,tr) I know what a double crochet is and a triple crochet is but don’t understand is all that goes in the same stitch? Yes, 2 dc and a tr all go in the last stitch of the row. I just want to say thank you for posting this pattern, I used to have and lost it, but I like the way how you listed the 5 sizes, that was sweet of you. This is a lovely – and simple – afghan. I could work on it and not have to count stitches or keep track of which row was next. I made a large size for a wedding gift. The bride was speechless and the groom kept saying that it was too much. I got hugs and got to see how happy they were. That’s all the thanks any of us need. I know I’ll be making more of this afghan. Love it! Thanks so much for sharing the pattern. What colours did you do for the wedding gift as I am thinking of doing one as well?? I used a tan. It was either Caron pounder or Red Heart & was called lace. I wanted a color that would blend in no matter what their color scheme over the years. Just saw this email – sorry. I used Caron pounder in Lace. It’s a beige color & I wanted something fairly neutral but not white or cream. It’s a great pattern that you don’t have to think about as you’re working. I could work on it when we had friends over. They’re all used to me usually working on something. A few might think I was sick if I didn’t have a project in my lap. I made mine large enough for two to snuggle under, either a large, over the edge twin size or a double bed topper. This is a really beautiful pattern. I made it in a soft cream color and it was quite elegant. Thank you so much for the pattern. I will use it quite often for baby blankets. The first one was a throw for myself. I love the look of this and I can’t wait to get started! I’ve never made an afghan out of cotton before and am wondering how it feels in comparison to bulky acrylics. I’m also wondering about how heavy it is. I’m making this for a charity auction and I have to mail it in, so weight is definitely a concern. Any help or suggestions you can offer would be appreciated. Thanks. Cotton is quite a bit heavier than acrylics. I usually use cotton for baby items. For a full sized afghan, cotton would be very heavy. Are you crocheting in both loops or just one? interesting and beautiful pattern! thank you so much for sharing it with us … and the tutorial was SO helpful to understand the pattern stitches. funny that the last post asked about the front loop vs both loops. i started out using the front loop (which gives the nice ‘line’ thru the pattern), however, i switched to using both loops because my yarn seemed flimsy and i was afraid that it would stretch the loop. using both seemed to add strength. also … i am using rainbow colors to make this for my granddaughter. looks great! Good evening Mama. Very new to crocheting. Would love to try in a slower version. Do you have one. Could you explain a 2dc tr. Sorry, I don’t have a slower version. In the last stitch of each row (which is the top chain of the turning chain of the prior row), make 2 double crochets and a triple crochet. I want to make one for my grandaughter’s boyfriend and wanted it more masculine. This is awesome. Going shopping for yarn tomorrow! I’m a newbie at crocheting blankets, so I think Ill make a “mini” one of your pattern and see how it goes… like a baby security blanket. Love this pattern. Having trouble with the first row. Repeated to the last 7 . Now I still have 6 chains left. Things to check – did you skip 3 chains for the dec5 stitches? Did you begin the next 9 dc following the ch 3 in the next ch, not putting the first in same as the last of the other set? Could your beginning chain count have been off? Did I miss in the pattern where it says dc in the front loop? It doesn’t say in the pattern. I left it up to the reader to choose one or two loops. I love this pattern…I made a baby afghan using the basket weave stitch….Now I have what I was looking for a way to combine the two….Thank you…. This pattern is easy to follow. I just love the ribbed look. I have always made anything BUT afghans,. This pattern made me want to make at least one. I am now making a second one for my new granddaughter! I love to crochet and knit, now I am wanting to crochet a ripple afghan for a baby. Also I have a great-grandson graduating from high school and he wants yarn that looks like the camofladge yarn, how would this look in a ripple pattern. If you have time please advise me. Any of my ripple patterns can be made in baby blanket sizes. I think ripples work well with variegated yarns such as the camouflage. I usually don’t use variegated yarns for my samples to demonstrate patterns so that you can see the detail of the design, but often when I make additional blankets using a pattern I use variegated yarns. I just finished this afghan and love it because it was the same on every row. I made it for a friend and it is going to keep her warm. May have to make another one later. I am having trouble with counting the stitches for this afghan……for widths 47.75″ ….254…..I start with this amount and it has never worked for me….also what does 23 +1 beginning chain mean? The 23 + 1 means that the number of stitches in the beginning chain is a multiple of 23 plus an extra chain. For the beginning chain 254, that is 11 repeats of the 23 chains and then the extra – 11×23 + 1 = 254. In the first row, you should use 16 chains before the repeated section. The repeated section should use 23 chains ten times, so after 10 repeats will use 230 chains. The section after the repeated section uses 8 chains. So 16 + 230 + 8 = 254. If you have stitch markers you could mark your beginning chain at the 8th chain and then at every 23rd chain after that ten times, and then you would have 16 more chains. Then working back you should be working in a marked chain at the beginning of each repeat. I am makeing this with 185 chains. How many points should I have b/f the last 8 chains. When I come back I do not get to the chain space (2dc,ch2,2dc). Please help. Thank you. When you come to the last 8 chains, you will be at the “valley” of the last of eight valleys for the row. Did your row one work out so that the repeat brought you to these last 8 chains? And where are you when you reach the (2dc, ch2, 2dc) for the chain space? I really love this pattern and can’t wait to make it! Mama, you truly are an unselfish teacher! People sometimes struggle with a pattern, no matter how clearly it is written. I am delighted to see you take time to respond with further explanation. I don’t see that happening too often on many other sites. Congratulations on lovely and unique patterns … and THANK YOU for sharing your talent! I love this pattern and have done around 4 rows so far. But, I just saw that your sample was done in the front loops only and the pattern did not state that. The next row I’ll start the front loops only and at the last 4 rows I’ll do both loops. I really hate ripping that much out. I didn’t specify one or two loops because it can be done either way. Some may like the two loop look better and think that makes a tighter woven blanket. When it makes a material difference, I do specify. Is the extra large afgan large enough to cover a king size bed? Hi I really love these pattern but you know? I can not undestand the written instuctions; so I wonder if you had a video I have triedthe you tube videos but I dont know how to turn and make the second row so I would appreciate it if you can help me. Thank you. Hi Mama. I was looking to do a ripple that wasn’t just your every day ripple. Very nice pattern. However, when working from the written pattern, there is no mention of the double crochets being made into the front loop only. I could tell by looking at the texture that only the front loop was used and verified that with your video tutorial. You might want to note that in your pattern. All double crochets are worked into the front loop only, starting with row two. It looks entirely different if you don’t do it that way. Thanks. I just wanted to add, I’m about six rows in now and VERY happy with how this looks. Very nice. Love it. Ok. Ha. You have convinced me. I’d been resisting saying that because it can technically be made either way, but so many have said they like the look of my sample and want to duplicate it. I will add that instruction. This pattern is on my TO MAKE list and I’m just about ready to start. However, I want to make it with lightweight “baby blanket” yarn. How do I figure out how many chains I need to start? Your pattern says 5mm hook and I probably will use 4-4.5. How wide do you want it to be? I had a system glitch and just now saw your reply! I’m so sorry for the delay in my answer. Start with a chain of 231. When you say DC in next 9chains, dec 5. Do you count the next stitch part of the next 9 set? Each repeat is 23 chains – dc in 9 chains, ch 3 then dc in 9 chains, then the dec5 which uses 5 chains. After that dec5, start another repeat by making dc in the next 9 chains. What colors and yarn type/brand did you use? This is Knitting Fever King Tut which is a 100% cotton yarn. It is two shades of seafoam. The darker is color 441 and the lighter is 1042. You may be working from an older version of the pattern. I added note between the first and second rows on 3/25/14. Hi, Mama! Your patterns rock! Your site is the first one I come to when I’m looking for a great pattern! On this gorgeous pattern, I would like to know if it is possible to use the Chainless Foundation stitch on this pattern? I love the way that looks on my other afghans, but it seems you have to have a straight edge to use that particular stitch. What do you think? If you think it could work, would you post your technique instructions? Maybe on a video? You are such a good instructor that I would not even trust myself to try to attempt such a feat! But you are REALLY good at explanations and so patient with the rest of us! THANKS!! I think it could be done that way. It would be based on the double crochet version of the chainless foundation with modifications for the increases and decreases. For the increases, multiple stitches would be made in the same stitch. For the decreases, build stitches as usual, but don’t complete the last part of the stitch, do that for 5 stitches then pull through all 6 loops on the hook. I have had video issues lately which is why I haven’t made any videos in a while. I’m not sure when I would be able to make a video for the method. I know I am probably bothering you, but I need a quick adult size purse or bag pattern that I promised to crochet for my sister for her daughter’s wedding, July 11th, 2014! She wants it to be in an off white color, all 1 color. Do you happen to have a pattern in your stash that you have done and like? Whatever you can provide me would be greatly appreciated! Thanks!! I don’t have any purse patterns, but I looked at Ravelry and they have pages and pages of free purse patterns. If you give me more specifications to narrow it down, I could find patterns for you. I want to make a ripple afghan that is approximately 45inches in width using a N hook how many chains would I start with?Would it work for either using SC or DC stitches . Start with 116 chains. This pattern will only work with DC stitches. You have several afghan patterns that are so beautiful. My problem is that I can not print up one of your patterns with just the directions. I get all of the comments as well as the pattern. I really hate wasting paper when all I need would be one or two pages. I end up throwing out 20 pages. If I try other ways to print a pattern I end up with missing text. Can you please help? Thank-you. There is a printer icon at the top of the pattern. It will create a print-ready comment-free version of the pattern. I LOVE this pattern. I have made two afghans with it: one of them in black and camouflage for the Linus project, and another in purple and white for a wedding gift. It’s easy because it’s the same row every time. I also love the texture the post stitches provide: it’s cushiony to the touch. I learned how to do front post and back post stitches on this project, and after doing so many, they really are easy! Thank you for the pattern. I will enjoy making it. I love the look of this pattern and hope I can work it for my last ‘heirloom’ afghan that I have been making for each of my grandchildren. I have made each a different pattern but all with main color of off-white and some sort of trim or small amount of each favorite color. Not having done many ripple patterns, I wonder, is it possible to do a border on a ripple so that I can work some color into the finished product? Or do you have a suggestion on how to work a row or two here and there to give it a bit of color without going overboard?? Thanks so much for all the work you have done to make this site such a great source of information and help! You can add a sc border all around in another color if you like. To do that, sc in each stitch, 3 sc in each corner stitch and 2 sc in the side of each stitch on the sides. Also 3 sc in each “peak” and skip 2 stitches in the “valleys”. If you’d like to add a little color throughout, since every row is the same, you can even just add just one or two rows of another color and then have a large set of the primary color. I was wondering if there is a border that would work well with this project. Probably just a simple sc border. To do that, sc in each stitch, 3 sc in each corner stitch and 2 sc in the side of each stitch on the sides. Also 3 sc in each “peak” and skip 2 stitches in the “valleys”. Hi….I’m trying… I’ve(fairly well it seems) successfully turned the strawberries and lace around to lefties mode but I just cannot wrap my head around this properly… any thoughts? And yes, I’d be a beginner. I have completed simple “either sided” blankets and what not but this is beyond me. Thanks for your great patterns and tutorials (slow down so I can mirror them in my aging brain …hehehe). Seriously though, thanks. These projects have been lifesavers like you can’t imagine. Is it mainly the Front Post Treble stitch that is the unfamiliar part? I found a video for making it left handed. For the large size, how many rows is the afghan? I want to put a pattern of 2 colors at the ends and a third color solid through the whole middle. I’m not sure how to calculate the number of rows for each section if it is to come out equal at both ends. I estimate the large size to have 99 rows. Is there a way to sign up to receive your updates, new patterns, etc.? I just found you through a link on All Free Crochet and LOVE your work. Though I haven’t tried doing your patterns yet (but I definitely will! ), they look well written and easy to follow – and you obviously have given ‘hookers’ help when they need it. Awesome! Do you send out newsletters or anything like that? Great site! thank you so much! Your Ribbed Ripple Reversible Afghan is beautiful! and I don’t normally like the look of ripples. But this one is simply beautiful! We are working on changes to the site that would accommodate optional updates, newsletters, and notifications. We will send out an email blast when it is ready. I’m curious if I could make this in a scarf width? Just wondering how it would look as a ‘classic’ scarf – not a long one, to wrap twice. But perhaps to be worn as an accessory. I think I can figure out how to do the width – using your formula. The yarn I have in mind is a beautiful hand-spun silk and wool blend, so probably a lighter weight than what you’ve used above. I’ve spent the last few months making scarves, amigurumi, hats, etc. for Christmas gifts and now I’d like to make something for myself. I think that would work well. It sounds like you know how to convert it as you like. I try to provide enough information in all my patterns to make them easy to modify. I haven’t started this afghan yet but I just purchased 4 colors of yarn intending to make a ripple in sc in back loops. I will experiment a swatch with my 4 colors first, but do you think a full afghan from this pattern will work using 4 colors? How many rows of each color would you suggest? Thank you for your help & for sharing your talent. People have posted some very lovely photos of this afghan with stripes on Ravelry, several with four color schemes. Looking through those photos, many have 4 row stripes, but a few have 2 row stripes or alternating 4 and 2 row. There are five different sizes given in a chart at the top. In the instruction section it says how many chains to begin with to make the different sizes. how do I add this pattern to my favorites for later use? We don’t have a favorites function on the blog. You could use a similar function on your browser. found this pattern and love it!!! I’ve made 3 baby blankets so far, and everyone’s loved them. What is the size of the baby blanket? How many stitches in you chain? I have some baby yarn “3” weight that I want to use, will that work? What size hook? For that weight yarn, use a G (4mm) hook. I think good widths for a baby blanket are 30″ or 36″. Start with a chain of 208 for 30″, or a chain of 254 for 36″. How do finish the afghan? It doesn’t really need an edging. You can just end it after it’s as long as you like it. Do not understand going in front loop of st. Could you help me please? That is the typical way crochet not made in-the-round is done when not making stitches through both loops at the top of the prior row of stitches. The “front loop” when making the row you are on was the “back loop” as you created the prior row. Love this afghan pattern. I just started I’m on row 2. I have made so many Afghans from your site. Your tutorials have saved me so many times. Can not thank you enough for all the patience and work it takes to do all this work. You have the greatest tutorials ever. Beautiful patterns. Perfect tutorial. So glad I found you. Now I am torn between the shell and Post afghan and the ribbed ripple reversible. This is for my 9 year-old grandson. I want it to last until he is a grandfather himself. What yarn should I use? We all have wool allergies. Would you recommend one of these patterns over the other? Is there a tutorial for the shell and post afghan? Thank you very, very much. So many people don’t answer questions but you are so kind and patient. Okay, I’m all set. Going to do the ribbed ripple reversible. The video tutorial was a big factor in my decision since I love them both. I’m going to use Vanna’s Choice by Lionbrand. I will get started if can ever stop looking at all your gorgeous patterns. I haven’t made a tutorial for the Shell and Post Stitch, but it is on my to-do list. I do have a chart for it. I have seen very lovely afghans made with both patterns. Ribbed Ripple is good for an overall cross hatch sort of pattern. Shell and Post has very distinct vertical lines if that is more of the effect you are looking for. I know some look down on acrylics, but they have really come a long way with them, and there some that are very pretty and soft. I have several acrylic afghans that I have laundered many times and they seem to hold up very well. Hi again, I last wrote to you on Oct. 25 just before I started this project. I am down to the last 9 rows. I made it mostly Colonial blue with 3 separate repeats of 2 rows of red, 4 taupe, 4 oatmeal and 2 red. It is so beautiful I can’t believe I made it. I am giving it to my oldest grandson (age 9) for Christmas. No one except m husband knows I have been working on it for 7 weeks. While the pattern is easy once you learn it, it is slow going for me. Each row takes me almost 90 minutes! So the “quick” part of the description is not true for me. I will try to send you a picture when I’m finished. Thank you very much for sharing your beautiful patterns. Thank you for all your information, hard work and dedication. I am also an advanced beginner. I recently discovered Tunisian crocheting and have started playing with it. Do you have any patterns or instructions for Tunisian? Your patterns are beautiful and your instructions easier to follow and keep track of. I hope to post some Tunisian patterns in the future. I have one design that I haven’t posted because it was more advanced and felt I needed to start with more basic patterns. Hi Mama, I completed this blanket using 2 strands with a N hook. I’d love to show you a picture. Anywhere I can upload it? I’d love to see a pic! You can e-mail it to mama at thetucker dot com. Thank you so much for making my first attempt at a ripple pattern so easy to follow. I appreciate the time and dedication it has taken you to put this together for us. I have your site in my favorites and plan on tackling everything! Thanks again for all your hard work and wonderful patterns. I made this afghan about 2 years ago, and did not do the front loops only. I believe it made for a stronger and longer lasting afghan, particularly is worsted weight is used. It is a fairly heavy, not too heavy afghan. It is a favorite from the friends that I have made them for. Two were newborns. I was wondering if it was possible to do this blanket without the Ripple? What would I have to do differently? Thanks! How do you think this afghan would work with a bulky yarn Like Bernat baby blanket yarn? I originally bought it for another pattern and decided not to do that one? It would work fine. It will be a really thick blanket, but that might be just what you want. A twin size bed cover would be 69″ x 90″ This would take 6867 yards of yarn and start with 369 chains. I am making a double crochet ripple afghan for my son. I would like to put an edging on it. Do you have a good suggestion for an edging? Thank you. On ripples I like to stay simple with just a single crochet or maybe picot edging. There is already so much going on with just the ripple itself. If you edge the rippled edges you will need to make adjustments to keep with the ripple pattern. Thank you for your reply Mama. You are extremely helpful. I love your site. I am using a total of five colors. 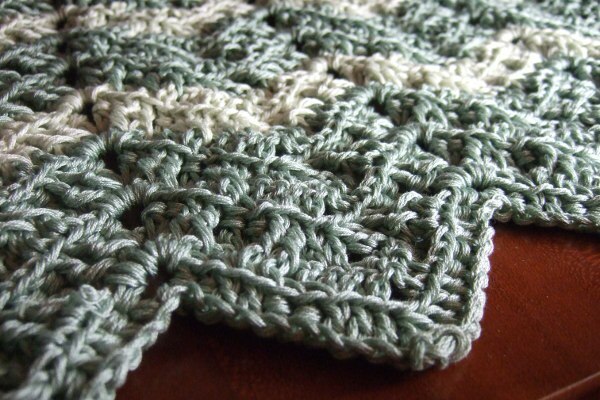 The pattern calls for two rows of double crochet with one color – then switching color. When I edge the sides, would I be doing 2 single crochet for each row of double crochet (4 single crochet for each color)? If I edge the ripple in single crochet, would the adjustments I make just be to follow the same ripple pattern I am currently using for the double crochet? If you are only doing a row or two of single you could just follow the same pattern, but for more would need to half the number of reductions/increases because reductions and increases have double the effect for the shorter single crochet stitches. If you are doing a wide border then I think edging in double crochet to be consistent with the blanket would look good. Hi, I love this pattern; have been searching for the perfect one to make my m.i.l. an afghan. But was wondering, would it be OK to use a chunky variegated yarn which is kind of self-striping? I have ordered and received enough Ella Rae “Seasons “, which is an acrylic/wool blend. Really gorgeous yarn, but worried it will look strange since striping won’t be well-defined like when you use separate yarns of different colors. Sorry for long question…thank you so much for your time and help! ! I have seen several of these made in self-striping on Ravelry and they look great. You are correct that it won’t be exactly the same effect as having separate yarn colors, but it is still a good outcome. I have always liked the ripple pattern and this one is very nice. I really like the reversible aspect. Thanks for sharing! I note that the increases are written “2dc, ch2, 2dc” in the pattern. However, your chart shows ch3 at the peak. Which is correct? Ch2. I made that chart as a quick visual and have no idea why I put 3 chains at the peaks. It should definitely be 2. Thank you for your reply. The afghan is beautiful. I’ve been teaching others to make it as well. Some of them insist that they can’t read patterns. Since this one is so easy to memorize, that’s no problem.